Anyway! Here is versatile jewelry that I do not dislike. Spoiler: mostly it is minimalist and geometric. The Iskin Pop Necklace is a simple circular aluminum necklace that comes with five interchangeable acrylic discs in various colors: clear, yellow, dark green, dark blue, dark red. This is my favorite necklace. I’ve owned it since 2014, I wear it probably 70% of the time, and the only wear it’s showing is a scratch or two on the acrylic and a couple of kinks in the wire. I get compliments on it all the time. (You can see it being worn lopsided in my Wallis Evera review.) The discs are held in place with an aluminum-and-silicone ring in the back that you can pop out by pressing on the acrylic disc. This is a necklace that works if you’re a matchy-matchy person, if you like contrasting colors, or if you want something minimalist. 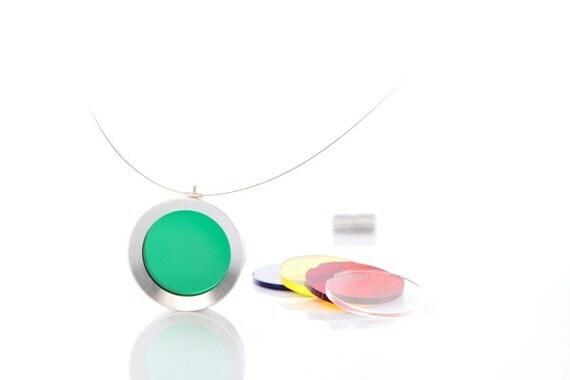 If you prefer earth-tone neutrals, they also offer a Pop necklace with aluminum-backed wood discs. If you prefer colored aluminum, they offer a version with bullseye-shaped colored aluminum discs. Though I find the marketing images for that one kind of deceptive. It does not come with a black or a green backing disc, only a silver one. I painted one side of my backing disk black with nail polish, because I am a responsible adult with adult jewelry. They let me buy a modified necklace with all the discs. If you want to do that, definitely contact them and ask! Consider whether you need that much variety, though. I use the acrylic discs all the time, I use the aluminum ones occasionally, and I hardly ever use the wooden ones. I also own this Iskin necklace, which is equally versatile color-wise, but I have more reservations about it. The colored parts screw on, and they frequently unscrew themselves. Its silhouette is a little less versatile. Also, instead of getting compliments on it I get “that looks like a cigarette” and “is that a religious symbol?” So… not really what I’m going for, audience-wise. There are only two downsides to this necklace. One, the large, chunky clasp turns around to the front pretty often. Two, the Iskin designers are from Argentina, so be prepared to wait a really long time for your necklace to come in the mail. Also, if weird stuff happens to your package, call the post office. They almost sent my necklace back to Argentina. On a personal note, this necklace got me interested in paring down my wardrobe to things I really loved. It was a gift from my fiance Justin, which made me extra motivated to wear it all the time. Surprisingly, I didn’t feel bored, or frustrated, or like I wanted to choose other necklaces. I just felt… kind of relieved, like my life had a little more consistency and a little less decision paralysis. Now I look for that feeling when buying new stuff. Often items I really love give me the urge to get rid of every other version of that item I have. I bought the Large, though, which was a mistake. I wouldn’t recommend it unless your wrist circumference is at least 7.5″. They also offer it in a wider version and in gold tones. Apparently I like necklaces with circular pendants! 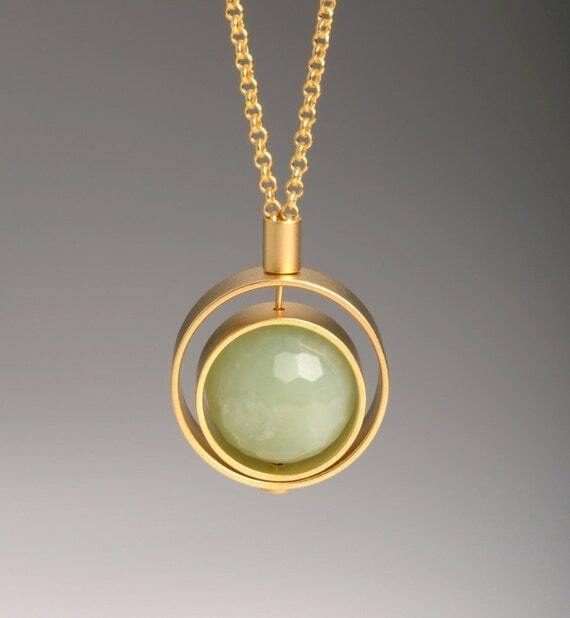 I have this necklace and enjoy it: the chain is thick, the pendant feels weighty and substantial, and jade green is a surprisingly versatile color. If you don’t think it’ll work for you, closeupjewelry has similar pendants in onyx, turquoise, howlite, and pink jade, as well as a silver-toned pendant in picasso jasper. I did manage to catch the necklace on something and broke the chain, but some jump rings and jewelry pliers fixed it up. Also, if you like more than one thing in closeupjewelry’s shop, you get a 10% discount for buying two or more items and a 20% discount for buying 3 or more. I don’t really own any! However, I love Lee Vosburgh of the blog StyleBee‘s taste: she seems to go largely for simple, geometric gold-tone jewelry, often with white accents. I like the Claire Green necklace in this post ($175), the Morning Ritual necklace in this post ($56), and the BIKO necklace in this post ($148). I especially enjoy that you can wear the BIKO necklace long or short. Want jewelry that discreetly syncs with your smartphone and vibrates to let you know you’ve got a call? OK, I cannot actually recommend this: I have not tried it, it is expensive, and it is not my style. Regardless, I just want people to know that said jewelry is actually a thing that actually exists, and I think that’s pretty rad.